"The residents of Mayflower know that issues like Keystone XL affect every American, but especially those that have to live with the danger in their backyard." Video: Sister Maureen Fiedler on Bringing the Bluegrass Gas Pipeline to "something of a standstill"
Last night, I attended a program in Arlington, Virginia about an impending U.S. Forest Service decision on whether to allow fracking and horizontal drilling for natural gas in the George Washington National Forest in Virginia. As the organizers of the program explained, fracking in the George Washington National Forest "could threaten a range of resources – including the headwaters of the Potomac River, the D.C. area’s major drinking water source." Could "the Midwest would be out of propane by early March?" As TransCanada Gets More Desperate, Is It Attacking Rail to Promote Keystone XL? One thing we've noticed with regard to the debate over the Keystone XL (KXL) Canadian tar sands export pipeline, is that as TransCanada gets more desperate about the plight of Keystone XL - a key piece of tar sands scaling infrastructure - the more aggressive it has gotten in emphasizing rail's deficiencies. The reason they're doing this is obvious: to try and make the case that the Keystone XL pipeline is indispensable, since there supposedly are no viable options to transporting tar sands oil. Bob Pickard has worked for dirty energy public relations firms in the past, but he's dead on correct and exhaustive in this piece ("The Climate Change PR Disaster"). A few key points. For anyone who believes that the recent chemical spill in West Virginia was an aberration, this article demonstrates that it's actually just the latest example of how the coal industry's been systematically and knowingly poisoning our water supplies for years. We're all torn up about this story. This morning comes news that hundreds of thousands of West Virginians could be without tap water for several more days. This comes after a chemical, "used in processing coal, spilled out of a containment tank Thursday morning into the Elk River about a mile upstream from the water company’s treatment facility." This chemical, "4-methylcyclohexane methanol can cause nausea, dizziness, vomiting and eye and skin irritation, authorities said," with "[a]t least 73 people reported to emergency departments complaining of skin irritation, nausea or vomiting" so far. Why Did 60 Minutes Focus on Cleantech, When There's Rampant Waste, Fraud and Abuse with "Clean Coal" Program? Sometimes, the actual news seems more like an Onion parody. This is a great example. Radio Disney has withdrawn from a pro-hydraulic fracturing school tour backed by the oil and gas industry. Al Jazeera America reports that the program, called Rocking in Ohio, visited 26 elementary schools and science centers across the state last month. The tour, led by three Radio Disney staffers from its Cleveland branch, offered interactive demonstrations on how oil and gas pipelines work. The Ohio and Gas Energy Education Program — which is supported by oil and gas companies — funded the project. Radio Disney planned to take the tour to other states if the Ohio tour proved successful. However, after being dragged into an unlikely controversy, Disney said they were pulling out of the remaining installments of the Ohio tour, according to an email statement sent to Al Jazeera. It's good to hear that Disney's backing out (albeit only under pressure to do so), but what's most ridiculous is that this was even allowed to happen in the first place. On the other hand, perhaps we shouldn't be too surprised about this, given that Disney's Epcot Center has a pavilion called "Universe of Energy," which was sponsored from 1982 through 2004 by ExxonMobil, and which included pro-fossil-fuel propaganda like this comic book aimed at kids. 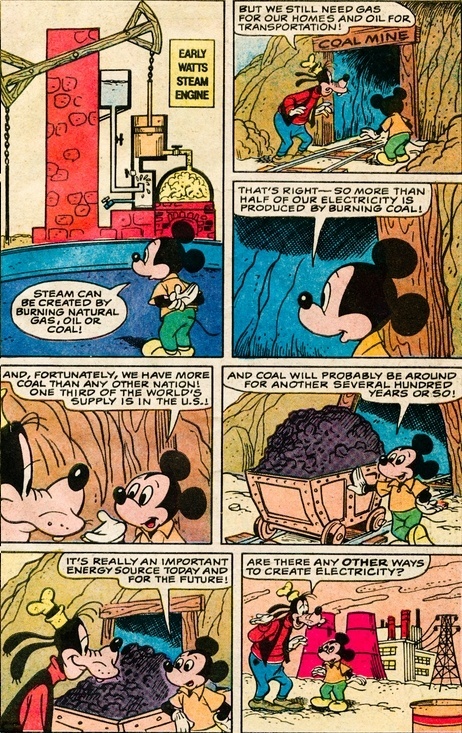 In other words, Disney has a long tradition of marketing the wonders of fossil fuels to kids. See below for examples of how they do that. "60 Minutes" About to Air Its Second Debacle in Under Two Months? This couldn't have happened to a more deserving company. Here are five recommended reads for today (1/2/14).